Eating clean is not as hard as some think. Coming up with recipes that are excellent , and beautiful can be a challenge. Ever since my father became sick I have been trying to cook clean and simple. 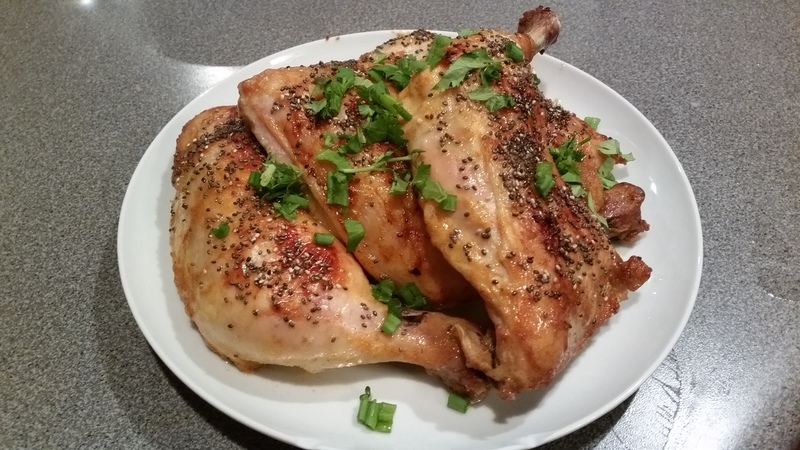 This is an excellent recipe for chicken leg quarters. Wash and pat dry chicken. Combine all spices except chia seeds and rub chicken. Let marinade overnight. Preheat oven to 375 degrees line backing pan with foil and lay chicken pieces on top. Bake at 375 degrees uncovered for minutes. * make honey water by mixing 1tbs honey and 2 tbs waster. Once chicken is golden brush with honey water mixture and sprinkle Chia seed over tops bake additional 5 minutes.